WHEELS, 17" (43.2 CM) ALUMINUM (STD), TRANSMISSION, 6-SPEED AUTOMATIC WITH OVERDRIVE (STD), TIRES, P225/65R17 ALL-SEASON, BLACKWALL (STD), TECHNOLOGY PACKAGE includes (UHQ) Chevrolet MyLink radio with Navigation and (UZ8) Pioneer premium 8-speaker sound system, SUNROOF, POWER, TILT-SLIDING WITH EXPRESS-OPEN AND WIND DEFLECTOR, SUN, SOUND AND NAVIGATION PACKAGE includes (CF5) power sunroof and (PCY) Technology Package, STEERING WHEEL, LEATHER-WRAPPED with audio and cruise controls, SEATS, HEATED DRIVER AND FRONT PASSENGER, SEATS, DELUXE FRONT BUCKET (STD), SEAT ADJUSTER FRONT, DRIVER 8-WAY POWER WITH POWER LUMBAR. 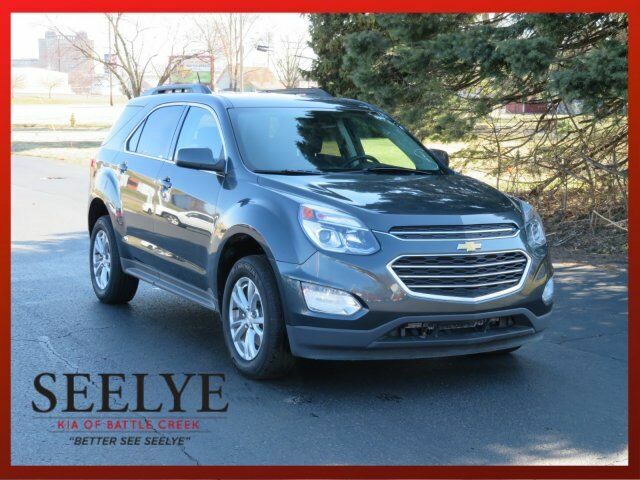 This Chevrolet Equinox has a strong Gas V6 3.6/217 engine powering this Automatic transmission. CONVENIENCE PACKAGE includes (C68) automatic climate control, (BTV) remote vehicle starter system, (NP5) leather-wrapped steering wheel with audio and cruise controls, (AE8) driver 8-way power front seat adjuster and (KA1) heated driver and passenger front seats , LT PREFERRED EQUIPMENT GROUP Includes Standard Equipment, LPO, WHEEL LOCKS includes 4 locks and 1 key, LPO, CARGO AREA CLOSE-OUT PANEL, JET BLACK, PREMIUM CLOTH SEAT TRIM, GVWR, 5300 LBS. (2404 KG), EXHAUST, DUAL WITH PREMIUM TIPS, ENGINE, 3.6L V6 SIDI (SPARK IGNITION DIRECT INJECTION) with VVT (Variable Valve Timing) (301 hp [224.4 kW] @ 6500 rpm, 272 lb-ft [367.2 N-m] @ 4800 rpm), AXLE, 3.39 FINAL DRIVE RATIO, AUDIO SYSTEM, CHEVROLET MYLINK RADIO WITH NAVIGATION, 7" DIAGONAL COLOR TOUCH-SCREEN AM/FM/SIRIUSXM STEREO with MP3 playback capability, GPS navigation system, outside temperature indicator and Radio Data System (RDS), includes Bluetooth streaming audio for select phones; voice-activated technology for radio and phone; Hands-Free smartphone integration with Pandora and Stitcher; Gracenote (Playlist+, Album art), AUDIO SYSTEM FEATURE, PIONEER PREMIUM 250-WATT 8-SPEAKER SYSTEM includes mid-range speakers in each door, tweeters in A-pillars, a center channel speaker in upper IP and sub-woofer on the rear shelf, ALTERNATOR, 155 AMPS, AIR CONDITIONING, AUTOMATIC CLIMATE CONTROL, Wipers, front variable-speed, intermittent with washer, Wiper, rear variable-speed, intermittent with washer, Windows, power with Express-Down on all 4 doors, Wheels, 17" (43.2 cm) aluminum, Visors, driver and front passenger illuminated vanity mirrors, Transmission, 6-speed automatic with overdrive, Traction control.